This is part eight of “Films of 1949” series (Part 1, 2, 3, 4, 5, 6 and 7). In the previous post “Mistresses and Lovers”, I mentioned “There were many bloody incidents involving assassinations and terrorism, all linked to underground operatives of U.S. secret agency.” Alex in Florida asked me what this “underground operatives of U.S. secret agency” means. I’m afraid I dropped this historical trivia too casually, so I try to explain this. Before going into details, I would like to provide a little background. It’s about a railway system. The railway system in Japan was extremely important back in 1949. The Japanese Government Railway (Tetsudosho, J.G.R.) was the largest railway operation by the government for more than half a century. It was the artery of national transportation and logistics from Hokkaido to Kyushu, and operated majority of passenger trains and almost all cargo trains. Naturally, the worker’s union of such a nation-wide, vital institution had the tremendous influence on all other worker’s unions. Moreover, it had the most powerful means of negotiation with its employer (Japanese government, S.C.A.P. ): J.G.R.’s strike would have brought an immeasurable catastrophe on all aspects of Japanese society and economy. In 1949, U.S. government demanded Gen. Douglas MacArthur and his S.C.A.P. to tighten Japanese national budget and cut its deficit (Dodge Line). This led to massive layoffs in public sector, especially in J.G.R. More than 100,000 layoffs were planned in J.G.R. alone, and naturally worker’s union opposed the plan vehemently. At the same time, the communist infiltration into the Union was strongly suspected by S.C.A.P. The Cold War had already begun, and the communists were all Russian spies according to U.S. policy makers. Now U.S. and Japanese governments had to deal with it. In 1949, there were three gruesome incidents occurred in relation to J.G.R. First of the three is the Shimoyama Incident. On July 5, Sadanori Shimoyama, the President of J.G.R. at the time, was found dead on the track of the Joban Line between the Ayase and the Kitasenju Stations. His body was dismembered beyond recognition, apparently run over by the train. But the forensic results were not conclusive. The scientists were not able to determine if it was suicide or murder. Circumstantial evidence were also ambiguous. Shimoyama, a very diligent and honest public servant, was under tremendous stress to proceed with massive layoffs. He had pondered about possible his own resignation, and had discussed it with his closest friends. His activities and behavior on the day of the tragedy were fairly well-documented, and apparently he acted erratic and wandered about the places he had never been before. All these evidences pointed to suicide. However, he did not leave any notes or messages to his coworkers and his organization. Some considered this was highly unusual of him considering his royalty to his profession and the organization. Forensic evidence suggests he had been already dead when he was run over by the train. It seems that someone had killed him somewhere else and his body was placed on the track afterward. But another forensic expert was brought in and he claimed Shimoyama was not dead when he was hit by the train. Two opposing views were examined in the court and the discussion went deadlock. Until this day, the case remains mystery. 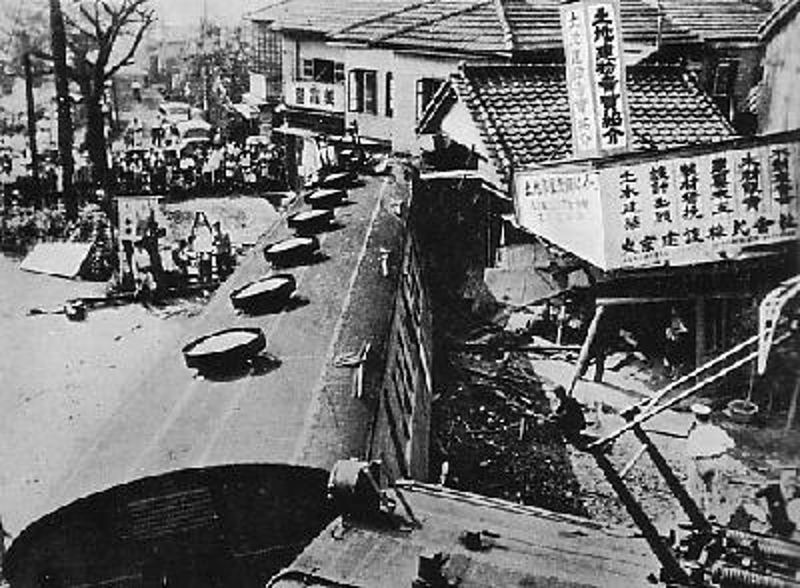 Ten days after Shimoyama’s death, the unmanned train ran over the rail-block in the Mitaka Station, killing 6. Police arrested 10 communists and the train driver on account of murder and sabotage. These communists were believed to have had planned the incident to terrorize the society and to intimidate the government to stop the planned layoffs. Most of the suspects were acquitted due to lack of evidence. A few months later again, another incident occurred in Fukushima Prefecture. Called the Matsukawa Incident, it was another act of sabotage. A part of rail tracks was removed, causing the train No.412 to derail, killing the operators of the train. Total of 20 communists, belonging to the J.G.R. union and the Toshiba union, were arrested, but after a series of long court battles, all of them were acquitted by 1963. Today, these three mysterious incidents were believed to be the results of S.C.A.P. intelligence work (1). The Shimoyama Incident may be the torture gone wrong. He opposed the massive layoffs demanded by S.C.A.P. and the top officials of S.C.A.P were not happy, some were furious, threatening him repeatedly prior to the incident. Two other incidents were believed to be designed to terrorize and coerce Japanese public to believe Communists were evil by tarnishing them as culprit (it’s the same tactics used by Nazis during 30’s). There are piles of circumstantial evidence which point to S.C.A.P.’s involvement in these cases (For example, a couple of days after the Simoyama’s death, a few G.I.s were witnessed scraping the bloodstains off from the railroad ties just few yards away from the scene). The truth about these incidents will never be known. However, there is one incident, that was unquestionably designed and carried out by an intelligence team of S.C.A.P. It is kidnapping of Wataru Kaji by the Canon Unit. During the initial stage of the Occupation, S.C.A.P. and its Government Section (G.S.) were more tolerant toward communist and union activities. Many of the key persons in G.S. were the New Dealers and encouraged the Japanese union members to voice their opinions and demands as means of democratic governance. However, the tide was changing. The north part of Korean peninsula was under communist rule, and the U.S. ties with the Soviet Union deteriorated quickly. Conservative wing of U. S. politics launched attack on the people whom they deemed as ‘pink’ or ‘red’, and certainly the New Dealers were their easy targets. This political wave rippled through the Pacific, and reached Japan eventually. Another section in S.C.A.P. was called G2, which was responsible for various intelligence tasks. G2 became the center of the conservative policy in the Far East. The Chief of Intelligence was Maj. Gen. Charles A. Willoughby, whose nickname was “McArthur’s pet fascist”. Willoughby, who did not conceal his admiration for Adolf Hitler, made many questionable decisions, including the dismissal of Dr. Ishii from the war tribunal. Dr. Ishii, the head of the notorious 731 Unit, had been responsible for the development of biochemical warfare in Manchuria during 1940-45 period, and had performed the most gruesome human experiments in the history. He and his unit were responsible for the deaths of more than 3000 Chinese, Russian and other P.O.W. According to some accounts, Dr. Ishii bargained his “precious human experiment results and knowledge of biochemical warfare” with U.S. to obtain his freedom. Not only that, it is believed that he was secretly employed by the U.S. military to cooperate in biochemical warfare development during the Korean War. Under Maj. Gen. Willoughby, there were many underground intelligence operations, one of which was called the Canon Unit. On November 25, 1951, Wataru Kaji, the writer and the activist, was kidnapped near his house in Kugenuma, Kanagawa. He was thrust into a military vehicle by several men in G.I. uniforms. Amazing as may it seem, he was held captive for more than a year, until his family reported him missing to the police. He was released on December 8, 1952. He revealed to the press that he was kidnapped by the group called the Canon Unit, operated by Maj. Jack Y. Canon. Canon demanded Kaji to become a double agent, to steal vital information from Soviet, while posing as a Soviet agent. Kaji refused to cooperate, saying he had never been a Soviet agent at the first place. In a sense, Canon had a good reason . Kaji did have a shady past: he had been an agent in China during the war. Ironically, that was one of the reasons his family failed to report him missing. He had a habit of vanishing for many months without telling anybody. Another reason was Kaji’s letter to his family. Canon made him write a letter to his family, explaining that he was at his friend’s house and there was no need to worry. A Japanese servant who was working at the Canon’s Safe House, saw Kaji and felt sorry for him. This servant delivered the letter to the family and discreetly communicated that Kaji was held hostage. It led to the public attention and the Canon Unit had no choice but to release him. Many of the Canon Unit personnel were Nisei, the second generations of Japanese immigrant in U.S.(2) They had little problem infuse themselves into Japanese society, and recruited many Japanese as U.S. spies. Some spies were sent to Union meetings, others were sent to the local Communist Party. If someone was not complying to their methods, they had a way of persuading him, including threatening his wife’s life. The Canon Unit had many Safe Houses and Offices in and around Tokyo, while most of its agents were all over the country. Kaji’s case must have been one of those ordinary cases, only it went sour. At the time of Kaji’s release, Canon was already sent back to U.S., to avoid criminal investigation in Japan. Probably, the Unit was disbanded quickly after the kidnapping busted wide open. The Canon Unit also had many shady Japanese companies and organization under its umbrella. One of them was the Asian Industries, which had the office in the same building as the Canon Unit. Some researchers claim that the members of the Asian Industries involved in the murder of Shimoyama (3), under the supervision of the Canon Unit. Other historians flatly deny this hypothesis. Gen. Maj. Willoughby’s team underestimated the activities of Chinese communists in the North Korea, and Willoughby was heavily criticized. Willoughby retired in 1951, only to become a private adviser to Gen. Francisco Franco in Spain. He died in 1972. In some references, it is said that Jack Canon started weapon trading business in Texas after his retirement from the Intelligence work. He was found dead in his house in 1981 under mysterious circumstance. He was shot in abdomen, but it was not clear if it was a suicide or an accident. (1) One of the most influential analysis of the ties between S.C.A.P. and three mysterious incidents was Seicho Matsumoto‘s “Black Fog Over Japan (日本の黒い霧)”. (2) The accounts told by actual Niseis can be read here. (3) The books by Tetsutaka Shibata are proponents of this position.